I’m privileged to live a short drive away from Holmes County, Ohio, where tourist flock to visit genuine Amish farms and businesses. There are also many Amish families living near my community in Lancaster, Ohio – not to be confused with Pennsylvania Dutch country in Lancaster, Pennsylvania. Ohio’s Amish country includes the charming towns of Millersburg, Walnut Creek, Berlin, Charm and Sugar Creek. Whether you visit on a weekday or the whole weekend, you’ll be delighted by the craftsman’s shops, unique hardware stores, and of course the restaurants. One of my favorite places to visit in Ohio’s Amish country is Heini’s Cheese Chalet in Millersburg. I might be slightly prejudiced because the owner, Lisa Troyer, is one of my dearest friends. But one taste of their handmade cheeses and you will also be a fan. You can even watch the cheese being made right in the factory! 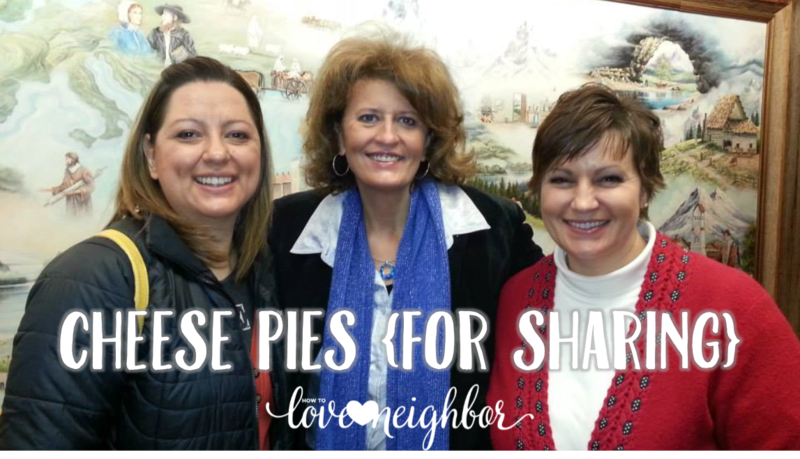 Lisa and I were joined by our mutual friend, Tricia Goyer, when Tricia was in town for a book signing. My husband cooked up a new recipe yesterday that I wish I could serve to my dear friends. It combines the creamy goodness of Ezra’s Feta, a Heini’s specialty, with tangy onions and delicious spices all wrapped in a tender crust that’s as simple as pie! Drain the brine from the feta. In a large bowl, gently combine all ingredients except pie crust. Cut pie crust into 3” circles and spoon 2 tablespoons of cheese filling into the center of the dough round. Pinch the dough together on opposite sides to form a boat, filling the corners with additional filling if necessary. Bake 13-16 minutes on a baking sheet greased with olive oil, Silpat® Mat (http://silpat.com/) (have you used one of these yet? Miraculous!) or parchment paper. Substitute your favorite blend of spices—we used za’atar, and it was delicious! 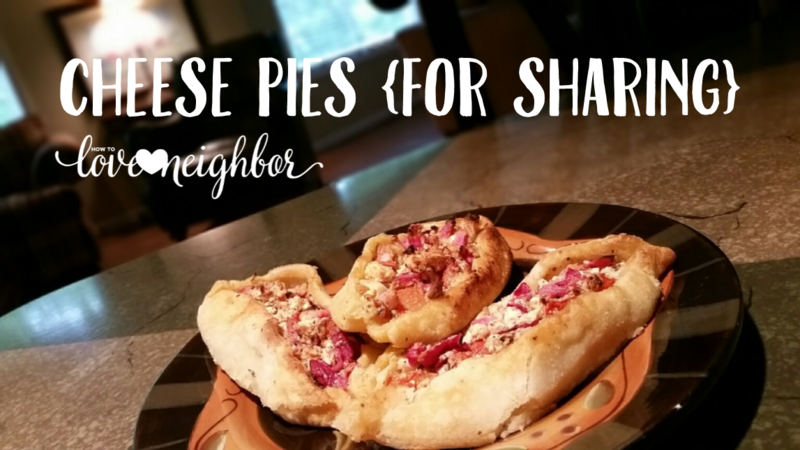 You can also use pizza dough, bread dough, homemade dough or mini quiche cups for the pastry—which makes the perfect appetizer to share with a neighbor. As simple as pie! 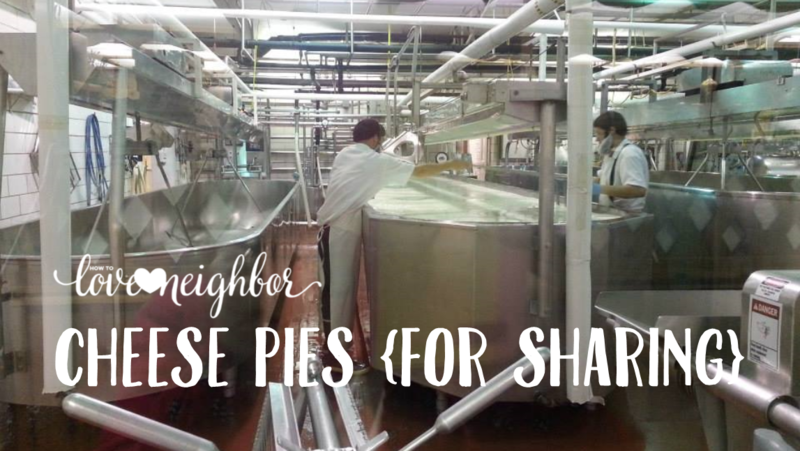 @NghborhoodCafe shares a tasty recipe for cheese pies you’ll want to try!